Based on the author’s 2006 Oxford doctoral dissertation, Alexander Sarantis has produced a valuable and illuminating treatment of the under-studied Balkan theatre during the reign of Justinian. 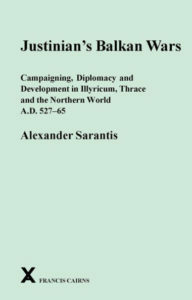 While the tight focus of the book permits Sarantis to delve deeply into the varied source material, its conclusions extend beyond the reign of Justinian and have broader implications for the political and military history of late antique and early medieval western Eurasia. This book takes a different approach to the diplomatic and military history of the age of Justinian by examining exactly what the title suggests. Sarantis questions the claim made by Procopius that the Balkans were regularly overrun by Huns and Slavs and that the theatre was a low priority for Justinian’s government. This book is a major contribution towards challenging the primacy of Procopius’ narrative for understanding the wars of Justinian, and reveals that the source base is far from inadequate to answer such questions. Nonetheless, Procopius’s suggestion about Constantinople’s neglect of the Balkans and the adoption of this idea in modern scholarship frames Sarantis’s argument. The general line pursued in this book is that substantial military and governmental resources were deployed to the Balkans. Far from being a backwater regularly overrun by “barbarians”, fewer raids took place than supposed and fewer still managed to do lasting damage. Sarantis approaches his material chronologically, which results in a narrative that occasionally branches into methodological and thematic issues. The first chapter presents an interpretive narrative from the accession of Justinian up to 540. Sarantis clearly sketches out the events and brings a variety of disparate sources to bear, which permit him to construct a compelling account. This reveals the interconnectedness of events and the multifaceted approach of Roman policy in the area. Sarantis argues that Justinian’s baptism of the Hun king Grod resulted internal strife in his coalition. With the murder of Grod and the Hunnic capture of Bosporos, major Roman military resources were activated and a land and sea campaign reclaimed the northern coast of the Black Sea for Constantinople in the late 520s. The Hunnic raid of 528 into the Balkans was likely fallout from these events. As Sarantis reveals, diplomacy and religion continue to play a major role in this theatre, and that major decisions used a variety of tools but ultimately served the strategic direction set in Constantinople. The baptism of the Herul king fits the broader policy of expanding orthodoxy but had the added bonus of a steady supply of high-quality soldiers. The Gepid alliance also points to long-term strategic thinking on Constantinople’s part, as Sarantis argues that their attack on the Sirmium area was likely Roman-inspired. This is a key point, as Sarantis opines, that the heaviest fighting involving the largest number of combatants during the Gothic war took place in Illyricum. The ca. 11,500 troops that Belisarius took to Italy were outnumbered by the ca. 15,000 that Mundo had in Dalmatia, and the fighting there was much harder than what Belisarius initially encountered on the road to Ravenna. By examining the Balkans, Sarantis shifts the focus of Justinian’s wars away from Procopius’s main narrative and opens up new perspectives. The second chapter steps away from the chronological narrative and instead examines the administration and the socio-economic conditions in the Balkans. The 530s were a peaceful time, unless, of course, one is inclined to accept Procopius claim that raids took place every year without fail, a position that Sarantis rejects. Stepping away from literary sources, Sarantis gives attention to archaeology here as well. The general conclusion is that the upheavals of the fourth and fifth centuries left a Balkans where military settlements are difficult to distinguish from civilian ones and the system of large-scale villa estates had come to an end. The sixth century saw fortress construction and upgrading by Anastasius and Justinian, and this process seems largely to have been complete by the 540s. Sarantis draws a number of conclusions from the fortification program, arguing that the existence of and investment in fortifications meant that there were still things in the Balkans worth protecting. He also notes that the fortifications should not be seen exclusively as static defenses, but rather as an interlinked network of bases for military communication and logistics, which provided the Roman state with the capacity to mobilize troops when and where they were needed. The third, fourth, and fifth chapters return to the narrative but also give attention to the interpretation of what the written sources said about the Balkans. Procopius becomes central once again here, since Malalas was writing less about the Balkans at this point and Marcellinus had died. From this, Sarantis concludes that Procopius neglected the theatre because of his lack of personal experience there and its lack of set-piece battles. Most of the chapter is concerned with general imperial policy in the backdrop of occasional raids and the Gepid-Lombard war. His conclusion is that the empire preferred to side with everyone, but to favour the weaker powers, with the intention of keeping any single polity from becoming overly strong. This worked throughout the 540s and 550s, but the eventual breakdown of the system through neglect by Justinian’s successors and the success of the Avars spelled the end of the strategic system employed by Justinian’s government. Sarantis argues here that the Roman state carried out these policies differently based on the type of society they were dealing with. For example, since the Slavs lacked any sort of complex hierarchy, they were difficult to negotiate with and military force was preferred. Similarly, because of the challenges in bringing steppe peoples to battle on favourable terms, diplomacy was preferred in that arena, while a mix of diplomacy and military pressure was applied against the Germanic peoples. That the Strategikon of Maurice advocates dealing with different peoples in a particular manner supports this conclusion. The delicate balancing act that the Roman state performed in the Balkans came crashing down in the face of Avar power. Sarantis argues that the Romans, to some extent, must take some of the blame for this. The Kutrigur-Slav invasion of 559 seems to have been fairly serious, and may have been exacerbated by an earthquake that brought down sections of the Long Wall and thus permitted them to approach Constantinople. Roman efforts to induce the Utigurs to attack the lands of their brethren while they were away on campaign were successful, but the violence left them vulnerable to the Avars and both are found to be Avar clients a decade later. Sarantis gives a final discussion to the archaeology. He concludes that the damage done was probably limited, as there is very little evidence for destruction. Attention is also given to the coin hoards. Here Sarantis is rightly cautious, and notes the difficulty in linking them to specific attacks. The most that can be said is that they point to an upswing in insecurity from the 540s. In the conclusion, Sarantis reiterates his arguments and makes a few interesting further points. He suggests that Justinian’s program of centralization in the Balkans was a success and that he managed to win over the “hearts and minds” in such a way that settlements do not seem to have closed their gates to imperial forces or negotiated independently with barbarian groups. The conclusion also sees a bit more attention to geography in the broad sense, and Sarantis argues that the challenging terrain meant that the Balkans needed constant attention from the centre, and the failure of Justinian’s successors to provide this is part of the reason that the whole system broke down. Finally, Sarantis credits Justinian with beginning the so-called Byzantine Commonwealth through his use of baptism, conversion, and settlement. This volume is judiciously supplied with supporting material. It includes thirteen maps which range from broad theatre-level maps to more detailed regional ones to those applicable to particular campaigns. Given the importance of geography throughout the book, these maps are particularly valuable. Also included are a couple dozen colour photos and a dozen site plans, all of which serve to illuminate the broader context. The book also has a timeline of military affairs in the Balkans stretching from the accession of Anastasius nearly to the death of Justinian. Those who wish to make use of this book without reading it through will be well-served by the excellent and detailed index. The lengthy bibliography is a valuable resource and contain an enormous range of material.